Organic granola with apple and chia seeds. 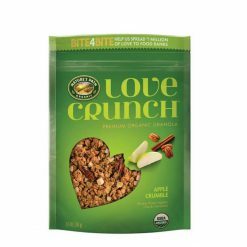 A deliciously sweet blend of toasted whole-grain rolled oats, tart green apples, pecans and cinnamon, this granola is like momEEs famous dessert, but for breakfast. ConsumersEE number one choice for an organic breakfast in the US, NatureEEs Path is a leading provider of healthy cereal, granola and snack products. All products are certified organic. NatureEEs Path offers a tasty range of cereals containing ingredients such as chia, hemp and buckwheat that boost nutrition by providing plant-based protein, fibre and omega-3 alpha-linolenic acid. Many of its cereals contain superfoods and some are suitable for vegans. Organic berry farmer Rupert Stephens taught his son Arran, the founder of NatureEEs Path”ays leave the soil better than you found it.EE Those words have been the motto of NatureEEs Path since it started making tasty flakes in 1985. They are also the reason the company is passionate about organic, community-minded and sustainable farming. Some 78% of ingredients used in the products are sourced in North America, the home of NatureEEs Path. The aim is to be good to people and ecosystems. The seed of NatureEEs Path was planted in the 1930s, when Rupert inherited the 89-acre family farm, Mountain Valley. Facing financial hardship, he used inventive farming methods, such as using sawdust as mulch. The result was rich crops and the publishing of a book entitled Sawdust is My Slave,EE in 1951. Growing up on that unconventional farm, Arran developed a lifelong love of soil and nature. He became one of the pioneers in the organic foods movement, and the Stephens family is still very much involved in the day-to-day operations of the company.